So…I’m trying to plow my way through this doggone “thing” I have. I don’t know if it’s a cold, the flu, or bubonic plague. Whatever it is has me feeling like crap, and I want it gone. Alcohol helps get rid of germs, right? It does, if I’m not mistaken. So, clearly that means this Caramel Apple Vodka Martini (with its two types of vodka) should do my body good. You see the image above? Well, I looked at this very image and saw absolutely nothing wrong with it. I photographed and everything! Nothing unusual stood out to me. It had the vodkas I needed for my martini. Apples were there. Caramel was there as well. All was right, right? Wrong. When Your Husband (Child, Friend, Cat) Offers Help, Take It. The Soldier, after I’d mixed the drink and he’d taken a generous sip and began coughing, suggested I rethink the recipe. Obviously annoyed by his lack of knowledge in the kitchen, I went ballistic. He didn’t know what he was talking about, so I chugged it to see what his malfunction was. I, too, began choking. See how clear that cocktail is? It shouldn’t be. I mean, gorg shot, but not the way the martini should look. You see, this caramel apple vodka martini was not a caramel apple anything, at all. It was, instead, a caramel vodka shot, which I poured into a martini glass. I’d totally spaced on adding the apple cider that was supposed to cut through the sheer liquor of it all. No wonder we were both swaying as we argued over the recipe. The Soldier was right, I was wrong. But I did point out that as a Soldier he should be ashamed that he can’t hold his liquor better. 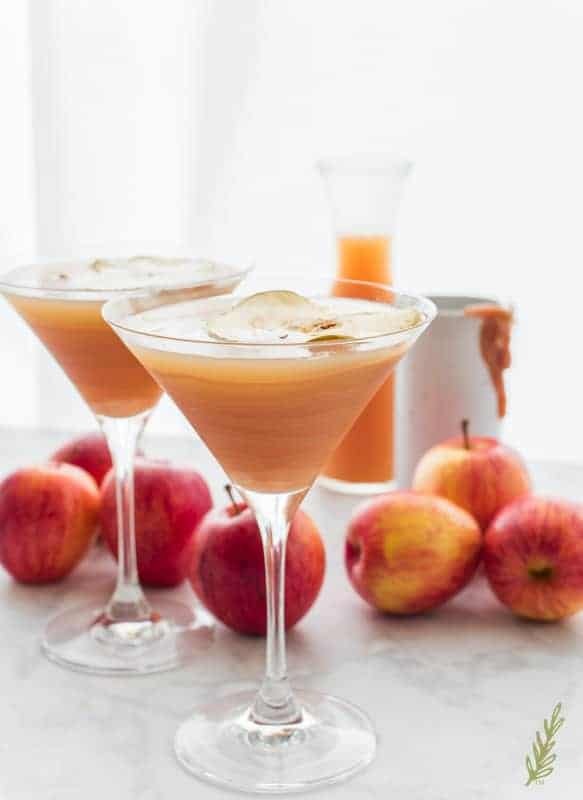 These are ALL of the ingredients in this caramel apple cocktail: APPLE CIDER (you can also use sparkling apple cider if you’re feeling festive), caramel-flavored vodka, vodka, ice, and caramel sauce (optional). One of the things I’m notorious for saying is, “Get your mise en place together before you start your recipe!” In my case- in this case- that’s a little tough to do when you’re actually developing the recipe. I’ve made this recipe a handful of times before, but the cider slipped my mind this one time. If you measure out, and set up your ingredients, you won’t frustrate yourself- well, not too much. Grab a cocktail set if you have one, because you’ll need a pair of tongs, the jigger, and the shaker. If you don’t have a set, just go ahead and add a handful of ice (if you’re making this cocktail for two) to the cocktail shaker. If you’re making the cocktail for a large group, skip adding the ice until the end, and grab a a pitcher, instead of the shaker. 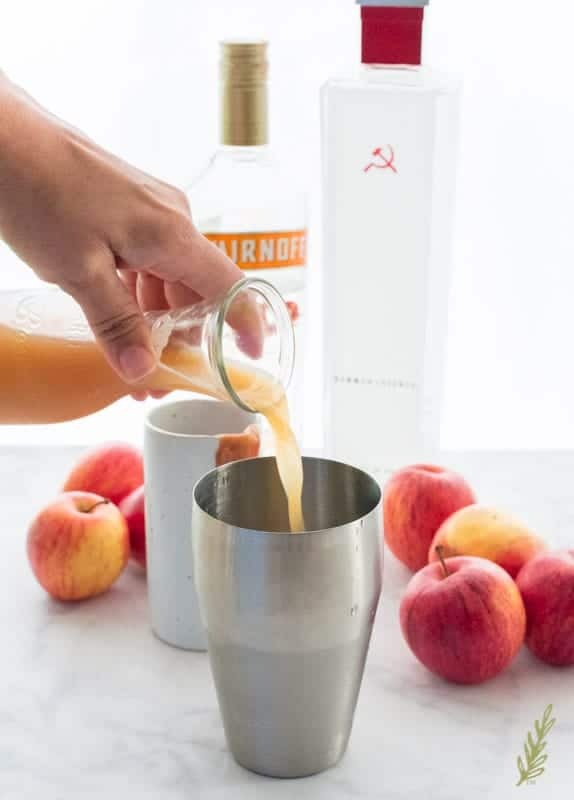 Add one one ounce jigger of regular vodka to the cocktail shaker. If you’re a lightweight, add a half-ounce instead. 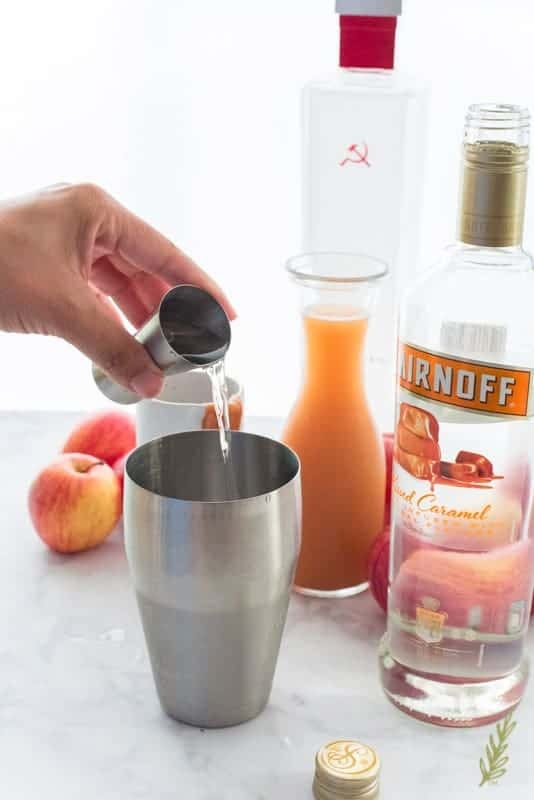 If you’re making this for a group, use a quarter of a cup of vodka- just add it to the pitcher. Follow that with two jiggers of caramel-flavored vodka. 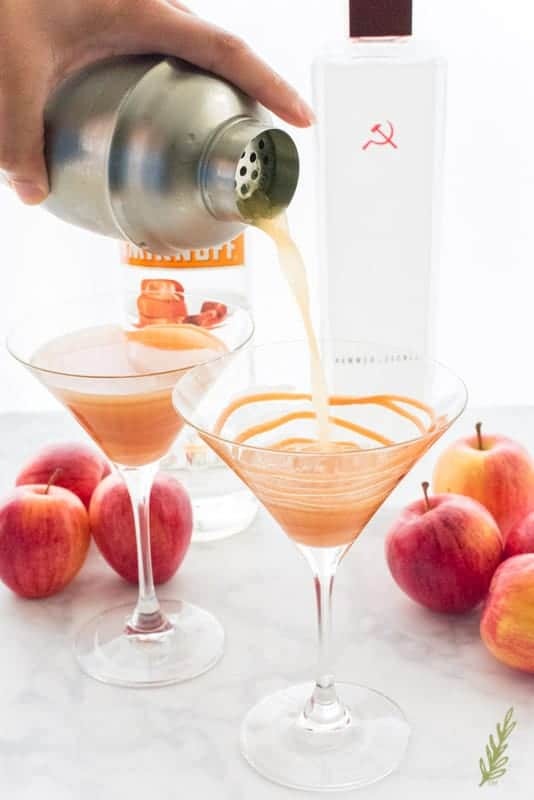 Use just one for a less-potent drink; a half-cup of the caramel vodka goes into the pitcher of martinis. 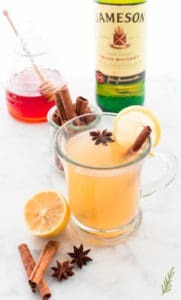 Pour in two cups of really cold apple cider and a dash of freshly-squeezed lemon juice to the shaker (a half-gallon along with a tablespoon of lemon juice for the pitcher version). Earlier I said, “Prepare to Frustrate Yourself,” and this is why. Your brain just doesn’t function the same when you’re sick. Case in point: me shaking the cocktail shaker without putting the top on. I mean, really?!?!? Who does that?!?! I do, obviously. 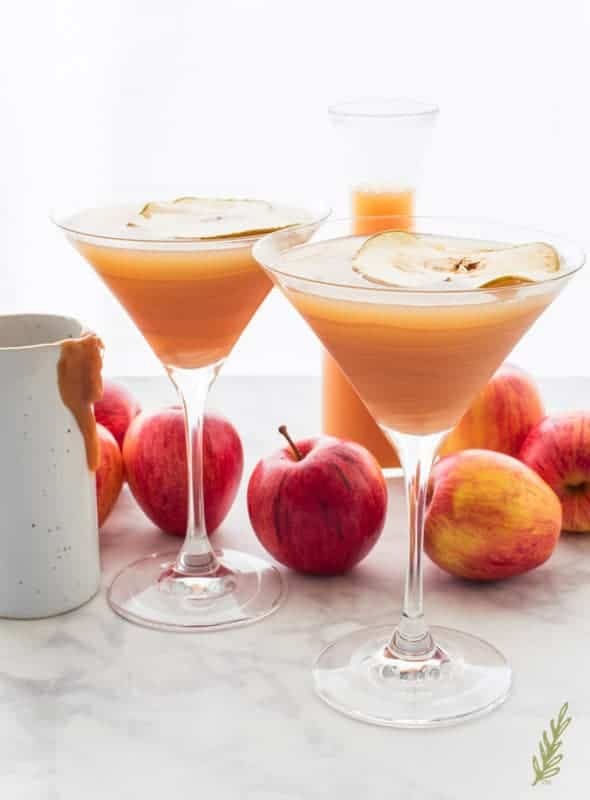 REMAKE the cocktail, put the top on the shaker, shake vigorously until the shaker frosts over, then pour the caramel apple mixture into two martini glasses. I swirled some caramel sauce into my martini glasses to give an added “oomph” of caramel flavor, but this is totally optional. 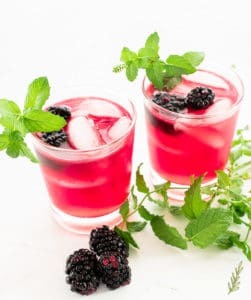 If you’re making the pitcher version, just stir with a long-handled spoon and when you’re ready to serve, add two to four cups of ice cubes to the pitcher before stirring again. You can pre-swirl your martini glasses and set them on the bar for service later. 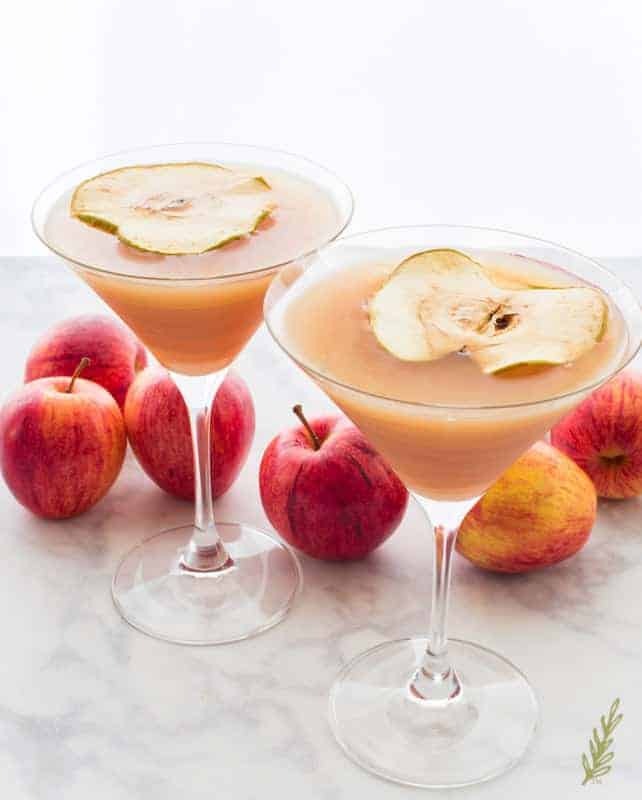 In addition to my fancy caramel swirl, I like to garnish my Caramel Apple Vodka Martini with slices of dried apples. You can purchase them or make them yourself. I thinly sliced green apples, then soaked them for about ten minutes in a bit of water that I added lemon juice to. After drying the apples with paper towels, I arranged them on a parchment paper-lined sheet pan. After that, I dried the apples in an oven set to one hundred seventy degrees for a couple of hours. Remember to flip them every hour to ensure they dry out evenly. Again, this is totally optional. So, yeah. That’s what I’ve learned about food blogging whilst ill. Don’t. I mean the reward is great, don’t get me wrong, but that first shot of pure vodka?!?! Not so much. How have you been holding up this cold and flu season? Any incidences you want to divulge? Pin this recipe, then share with me below! The classic martini gets a wintery spin with this refreshing cocktail. With option for two or a group. Add the ice to a cocktail shaker. If you are making pitcher martinis, add the ice just before serving instead. 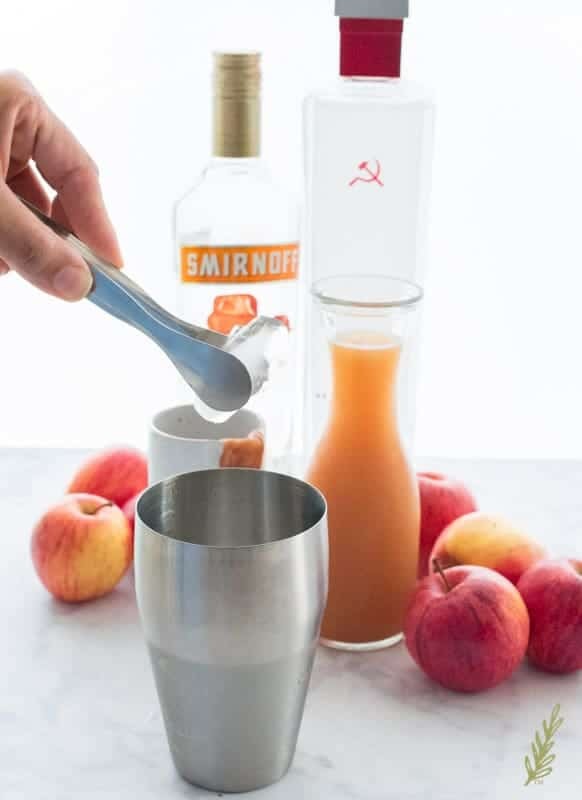 Add the regular vodka to the cocktail shaker. If you're making the large quantity martinis, add it to a pitcher. 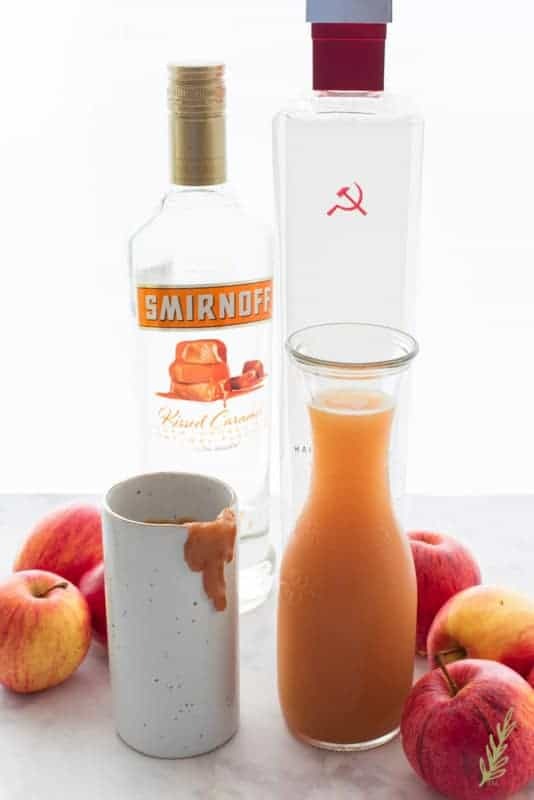 Follow with the caramel-flavored vodka. Pour the cold apple cider and lemon juice into the shaker (or pitcher) (eight cups for the pitcher version). Shake vigorously until the shaker frosts over, or, if you're making the pitcher-version, stir briskly with a long-handled spoon. 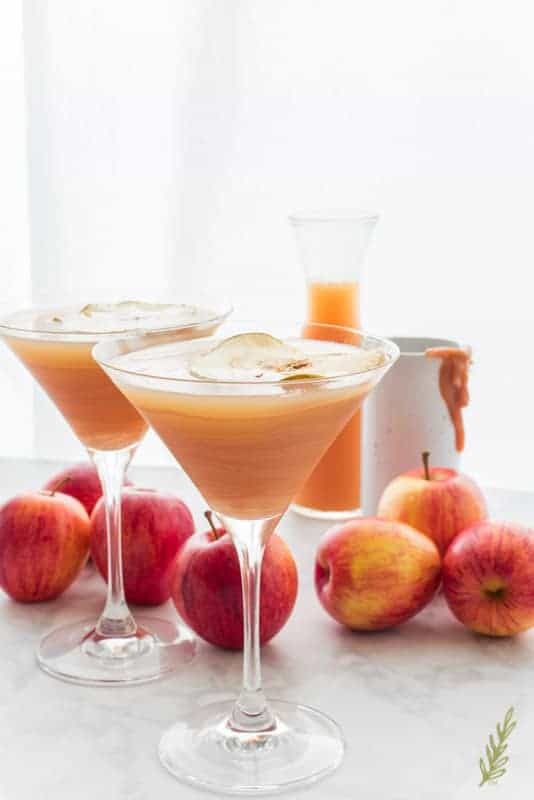 Pour the caramel apple mixture into 2 martini glasses swirled with caramel sauce, if desired. Garnish with dried apple slices. If you're making the pitcher version, add the ice just before stirring again, then serve. This pitcher version serves 8. 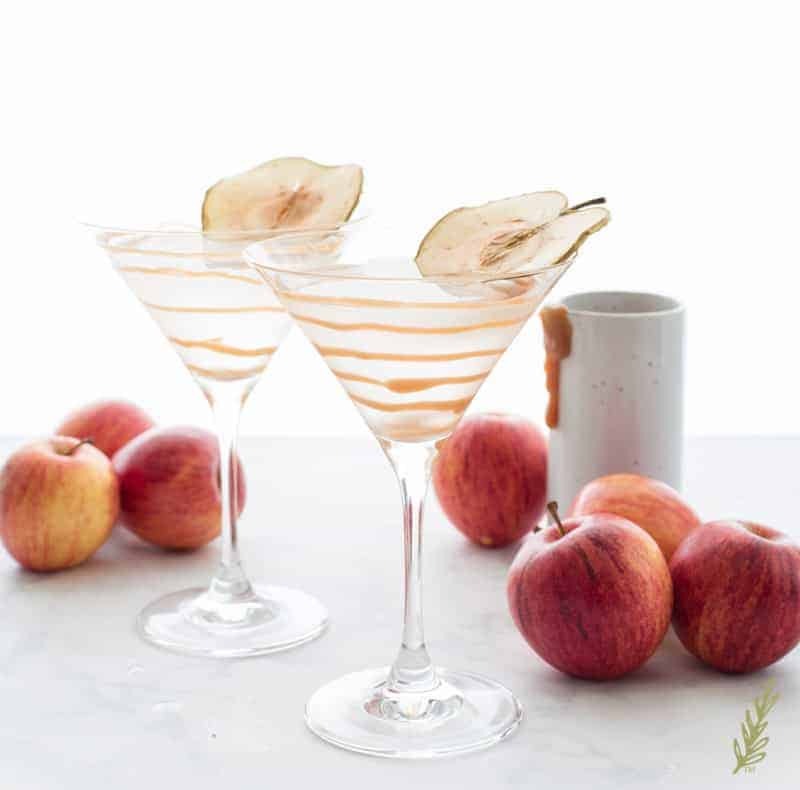 Garnish each martini glass with the optional apple slice. Thinly sliced green apples, then soaked them for about 10 minutes in a 2 cups of water mixed with 1 tbsp of lemon juice. Dry the apples with paper towels, then arrange them on a parchment paper-lined sheet pan. Dry the apples in an oven set to 170°F for 2-3 hours. Flip the slices every hour to ensure they dry out evenly. After drying, allow the slices to cool completely before storing them in a cool, dry container. 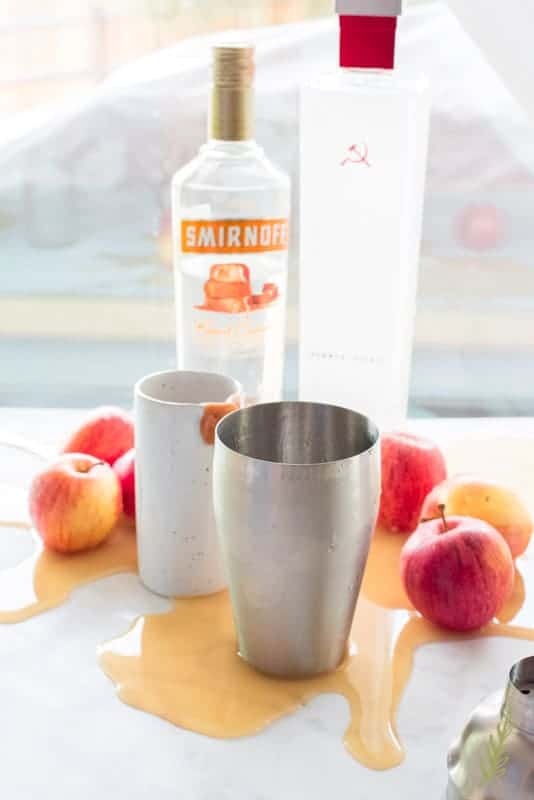 Haha I’m cracking up about forgetting the cider and shaking the shaker without the top on….TOTALLY something I would do!! This looks delicious! Girl! The struggle was real that day!!! Girl, you better swipe that vodka from her, quick! LOL!! Blogging while sick is NO fun! I feel your pain. Those cocktails are ridiculously gorgeous though and I need them in my life. Thanks, Leigh! It is a struggle, especially when all you want to do is rest and feel better. I don’t drink but caramel apple seems like the perfect seasonal flavor! And you garnished the drink so beautifully! I think you could sub out the alcohol and use a caramel syrup like Torani. Using sparkling apple cider will give a fun twist too, Justine! 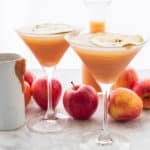 And I am officially giving up apple cider for this cocktail! Let’s make it merry hahaha amazing recipe! HA HA HA!!!! I LOVE your style, Gena!!! 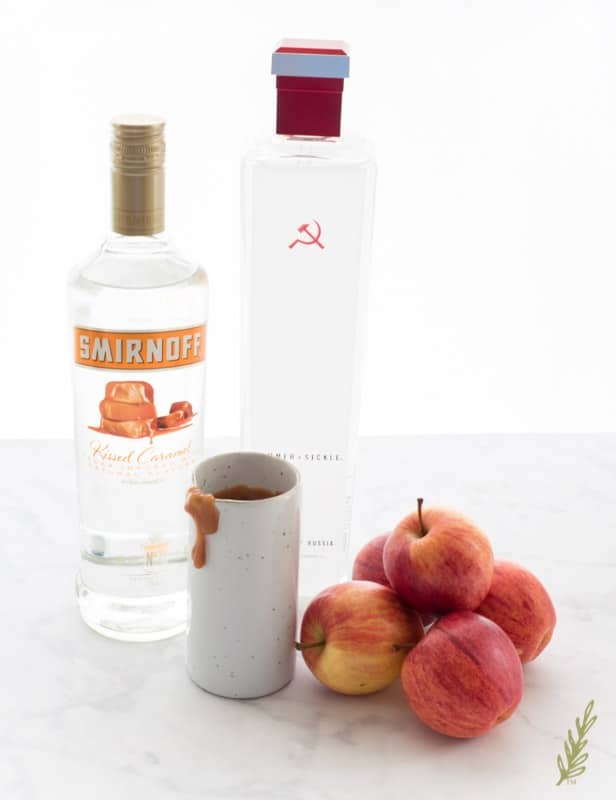 Looks like the perfect holiday drink! So yummy! caramel and apple are a match made in heaven! Sounds delicious! Haha, I love the logic on alcohol getting rid of germ. (And am totally going to use that line myself sometime!) 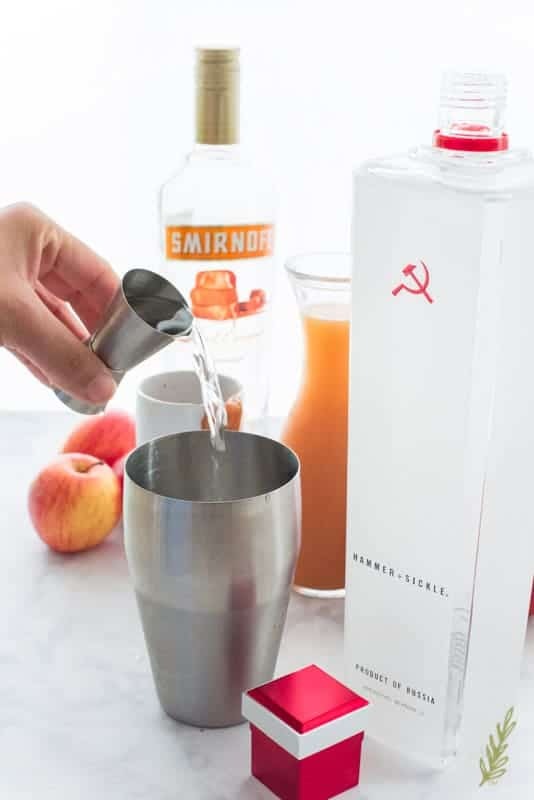 I’ve seen that variety of vodka at our local Total Wine & More shop, but have never picked it up. Now I have a reason! You’ll love it, Reese! I tasted it and was shocked at how good it was. Oh. My. Goodness. These martinis look fabulous and sound like they taste just as good. They would make a great signature cocktail at a holiday party! Ooh! Great idea, Erin! Now to plan a party! WOW! These sounds and look delicious! These would be perfect for any fall or winter inspired party! They are definitely great for holiday soirees, Amber!